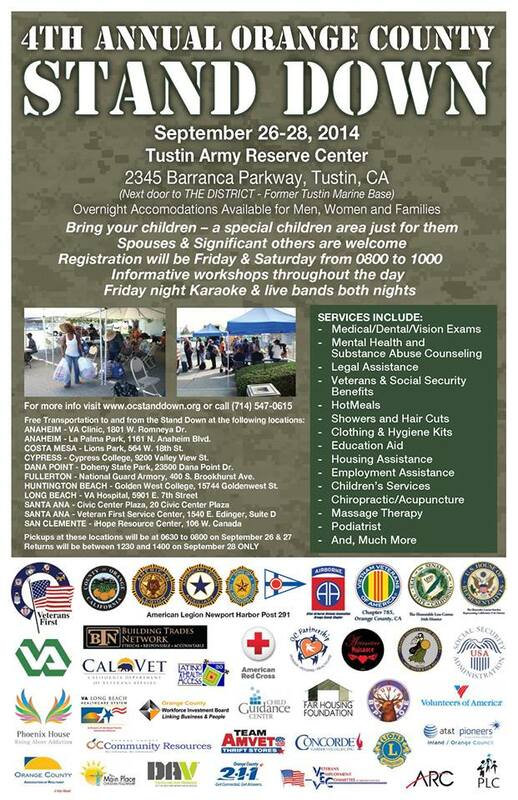 The 4th Annual Orange County Stand Down for Homeless Veterans and their families will be held September 26-28 at the Tustin Army Reserve Center. This event is being presented by Veterans First of Santa Ana and co-sponsored by VFW District 2. The Orange County Stand Down will be a 3-day event, set up like a military base camp in which homeless and at-risk veterans as well as their families will be able to come in off the streets and receive basic social services from a variety of community and government agencies. Additionally, attendees will have the opportunity to receive hot showers and grooming along with clothing. Our veterans will also be given hot meals and snacks throughout the day and have tents to sleep in, through which they will have the ability to bond with their fellow veterans. We will also have tents for families and female veterans. For more information, see the Orange County Stand Down flyer or visit www.ocstanddown.org.